Football is a team game, but it's the individual rivalries which make it interesting. There's always a sense of anticipation when two players with a lot of history come up against each other. Whether it be two players at the top of their game competing to be the best, two players with bad blood from previous encounters, or two players with entangled love lives (which seems to be surprisingly common), one-on-one battles are worth the entrance fee alone. Here are six of the biggest individual rivalries in recent history. Sergio Ramos' apparently deliberate - and successful - attempt to injure Mohamed Salah in the 2018 Champions League final was met with outrage from everybody associated with ​Liverpool, not least the Reds' defender ​Dejan Lovren, who is a firm friend of ​Salah. Lovren got his revenge when Croatia beat Spain 3-2 in the UEFA Nations League in November, and appeared to mock Ramos after the match with a social media post which read: "Haha! 3-2! Go ahead and talk now buddy. Buddy! They are a bunch of p*****s."
​Ramos responded with a picture of him lifting the Champions League trophy, overlaid with a shot of Lovren with his head in his hands. No words required from the Spain captain. In January 2010 it was revealed that England captain John Terry had engaged in a four-month affair with Vanessa Perroncel the previous year. Perroncel was the ex-girlfriend of Terry's former ​Chelsea teammate Wayne Bridge, and the affair had begun in the aftermath of their break-up. The so-called rivalry between Terry and Bridge received more coverage in the tabloid press than it did on the football field, although the pair did come face to face in a Premier League match in February 2010, with Bridge refusing to shake Terry's hand prior to the game. The fallout was more significant for Terry, who was temporarily stripped of the England captaincy after the news broke. Maxi Lopez was married to Argentine model Wanda Nara for five years before they divorced in December 2013 amid accusations of an affair between Nara and Lopez's former Sampdoria teammate ​Mauro Icardi. Icardi denied any wrongdoing, but he and Nara were married within six months of her divorce from Lopez. Lopez refused to shake Icardi's hand in a match between ​Inter and Sampdoria in April 2014, leading the press to dub it the 'Wanda derby', and there have even been claims that the Mafia told Lopez they would beat up Icardi if he wanted them to. Fortunately, he didn't take them up on their offer. This rivalry is another which is mostly a fabrication of the media's making. Steven Gerrard and Frank Lampard had a good relationship on and off the field during their careers as they played alongside each other for England between 2000 and 2014. Gerrard and Lampard were the poster boys of the Liverpool vs Chelsea rivalry which saw the two sides meet 25 times in the space of five seasons. They were very similar players, both box-to-box midfielders with great passing and shooting abilities, so the comparison was a natural one to make. Many observers believed that the two players could not be separated in terms of ability, but that was the problem faced by several England managers. Their similarities made it difficult for them to play alongside each other, but their abilities meant that neither could be dropped. Guess who's back? 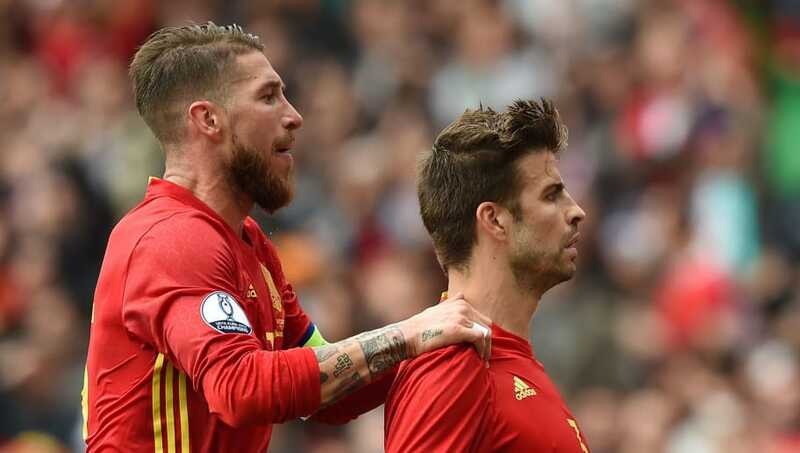 Ramos can't stay out of the headlines and his ongoing spat with ​Gerard Pique is made all the more intriguing by the fact that they've played over 75 international matches side-by-side for Spain, and very successfully so. It was in 2015 that their relationship really started to disintegrate as Pique repeatedly took digs at ​Real Madrid: mocking them after ​Barcelona clinched the title, labelling defender Alvaro Arbeloa a 'cone' for his stationary defending, and laughing when they were thrown out of the Copa del Rey for fielding an ineligible player. Ramos claimed that Pique's attitude was damaging to Spain's team atmosphere, but the two men have continued to trade barbs, and will presumably keep doing so until they retire. No list of footballing rivalries would be complete without the greatest debate of the modern era: ​Lionel Messi or Cristiano Ronaldo? These two players have stood head and shoulders above their peers for years, each setting new heights for the other to match. Much to the disappointment of the media, there does not seem to be any animosity between Messi and ​Ronaldo, with the former saying in 2014: "Only the media, the press, wants us to be at loggerheads but I've never fought with Cristiano." Both players have their legions of supporters who fervently believe that one is better than the other, but most people recognise that we should just appreciate these two while we still can.